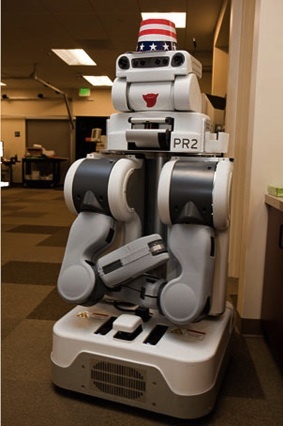 The PR2 robot is the creation of Willow Garage; it is being taught to perform all manner of useful functions (for example, see PR2 Laundry-Folding Robot). Our "Continuous Ops" team (Eitan Marder-Eppstein, Wim Meeussen, and Kevin Watts) just completed a new milestone that shatters all of our previous robustness records: 7 days, 70 km (43.5 miles) of continuous operation. The robot had to autonomously navigate around the office and plug itself in whenever it ran low on battery. The robot was allowed to announce it was "stuck" by sending a text message to the team. The team was then allowed to use a web page to get the robot out of the stuck situation, which they only had to do twice. As you can see from the photo above, the robot picked up some pieces of flair along the way. Getting to this level of robustness with the PR2 and ROS took lots of hard work -- over 250kms of debugging Linux kernel panics, building lights that wouldn't stay on, overheating batteries, and overzealous safety lockouts. He had left to him, without ever seeing it, the big luminous artifact with the jagged beam-cut slash and the V-shaped runners that in the millions of square kilometers of Ganymede had earned a name that held respect and some terror, for it was not like the other ruined and timeworn pieces of alien handiwork that were strewn through the whole Jovian satellite system. They called it Aleph. Some Jew had given it that, a blank name that was the first letter of the Hebrew alphabet: a neutral vowel that bespoke the opaque nature of the blocky, gravid thing, the bulk that humans had tried to write upon with their cutters and tractors and on which they had left no mark. From Willow Garage via BotJunkie.